we just got a 6 wk old gsd. he is very laid back and not very active. we practically have to carry him out the door and he just wants to sit or lay down.. is this normal? he will chase after my daughter a little if she motivates him but he does not move very quickly and does not seem to be as active as i thought a puppy would be. also we are sleeping him in a crate at night and the first night he did not sleep very well..he was crying and barking every 30 minutes or so..
will this subside and do i need to continue to take him outside in the night every hour when we are sleeping? Hi...my girl is almost 11 weeks now. I got her at 4.5 weeks as part of a whoops litter. I was very concerned that she did not like to walk much and slept a lot. That lasted until about 8-9 weeks old. In the past 2 weeks she has become more German Shepherd like. she runs, plays and has a lot more endurance and stamina. We got our puppies too young. That is the only thing wrong with your dog. ps...what a great looking dog. A breeder shouldn't even sell or place a puppy in a new home until that puppy is at least 8 weeks old. A 6 week old puppy may be able to eat soft foods, but normally also will still be nursing from the mother. Most puppies and even some adult dogs, will whine, cry, howl, etc, at being taken from a familiar environment to a strange place and then left alone. Imagine if you were suddenly picked up and taken to a totally strange place by giant beings you'd never seen before, everything familiar was gone, the security of having mother there to protect him is now gone, and this new place is full of new sights, sounds, scents, etc, and you're small and vulnerable and you don't know if you're safe or if something's going to eat you. Remember in the wild, anything that picks up a baby mammal other than its own parent, usually intends to do one thing, EAT IT. A young child or baby would have the same reaction as your puppy, the only difference being in the way each respective species is capable of expressing it. As for your puppy's laid back reluctant behavior, this could easily be a combination of stress and insecurity. You won't really start seeing your puppy's true personality until he settles in and feels secure in his new environment. Maybe this story belongs under Rescued...This 6 week olds post reminded me of our puppy. 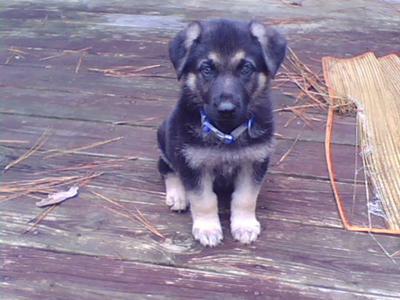 We knew we were going to receive a GSD puppy, but we were NOT expecting to have it arrive at just six-seven weeks old. We were shocked when they came and dropped off the puppy now named Jessi. They said she was throwing-up in the car driving over. They said she was very quite and liked to just lay around. Anyways she was not vary active at all and actually had nightmares crying in her sleep and waking up all the time upset at night. She also had an angry attitude during the day. I knew something wasn't right so I took her to the vet and had a complete exam. OMG! She had a hernia over an 1" - 1 1/2" and she was LOADED LOADED LOADED with ROUND WORMS. I mean speghetti bowls full!!! We got rid of all the parasites, changed her food from what was recommended. By eight weeks She was bouncing off the walls, happy and her skin cleared up. No more scabs and cysts all over her belly. Her hernia closed up. She has a beautiful shiny coat. Now Jessi is almost two years old and I'm crossing my fingers for her joint exrays to have happy results. She turned out not to be a lap dog, she's a Total Let's Go do it Working girl that wants a lot of mental and physical activities. She's high maintenance in this department and we Love her! What's the matter with you? 6 weeks, your puppy is a newborn. If you've ever read or heard anything about dogs, you know that a puppy should not be separated from the litter or its mother before he's 8 weeks old. Your puppy is a newborn and like most newborns requires plenty of good nourishment, love, warmth, attention and sleep, well as a toddler, etc. He may also be a bit lonely and sad. Need to ensure you hold him. Where did you get the puppy, cannot be a reputable breeder with any type of conscious, ethics or care of animals to have let you take him this young. Take care of him just as you would your own child and it will be reciprocated with love, devotion.